We cannot do everything, but we all can do something, and it should begin now. In my management training, there was a principle that was repeatedly driven into my head – do it now. This is true when handling paper; file it, delegate it, or take care of it, do not just shift it around in piles on the desk, and it is true in our pursuit of God and our calling. Do it now. Apathy and procrastination are enemies of our success in our employment and in our homes. Mix in some fear, worry and ignorance, and we can turn into a real mess! Thankfully, God specializes in cleaning up messes! God is a redeeming God and He will help us when we come to Him. This is true regarding sin, and it is true in our marriages and parenting. At times, we take stock of where we are in our marriages, parenting and daily walk with God, and feel overwhelmed. So many areas need help we end up feeling hopeless. We look at the entire picture and see that so much work is needed; we end up not doing anything because we cannot do everything. This is a lie that keeps us from walking on with God. God is not overwhelmed and hopeless is not a word used in reference to His children. As we consider this topic of fathering, we can become discouraged. We are supposed to be the bread winner, dynamic spiritual leader, prayer warrior, master repairman, financial wizard, and all-wise man of God walking in daily servanthood. Sometimes the pressure is huge, and our failures seem even bigger. So what should we do, give up? Not an option. 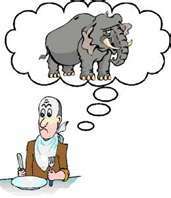 Another statement driven into my brain from the business world was this one – “Anyone can eat an elephant, just do it one bite at a time.” I do not know what an elephant tastes like, but I get the picture. These huge beasts can weigh up to six tons and that is a lot of happy meals at one setting! However, breaking down the meat into bite size chunks can and does take place. I do not have to eat the whole thing at one meal and I do not have to change everything to begin to make a difference in my marriage or family. I simply have to take small bites and chew, and sooner or later, the elephant will be gone. Ok, later, but you should get the picture. If I never start chewing, nothing will ever change. I must not let the fact that I cannot do everything stop me from doing something. 1 Peter 1:3-7- Likewise, husbands, live with your wives in an understanding way, showing honor to the woman as the weaker vessel, since they are heirs with you of the grace of life, so that your prayers may not be hindered. Learning to love our wives will help our children in many ways. As our children observe us, they will be learning valuable life lessons on marriage that will carry over into their own some day. As fathers, we will be demonstrating character traits like death to self, courage, deference, self-control, obedience to Scripture, and Biblical love. We will be training our sons how to honor women and our daughters what to look for in perspective suitors. There is a great deal in this section as well as the entire book, but for our purposes just notice how the relationship with God is impacted by how we treat our wife. God refused to accept their offerings because of how they were treating their bride. God also states that He was seeking godly offspring and He says that how the man and wife interact has a bearing on this! Prayers being heard, offerings being accepted, and the producing of godly offspring are pretty big issues, and worthy of my further study and time investment! After my relationship with God, the one with my bride is key. Effective fathering begins with loving my wife. Each man’s wife is different but God is clear that the responsibility to love her is the husbands, and therefore we are all in the same boat. We, as men, must learn how to love the wife God has given to us. Fortunate for us, there are many resources out there that will enable us to take the first bite of the elephant known as loving our wife. If we never start we will never grow, our marriage will never change, and our children will be deprived of a godly role model to follow. Here is what I am asking you to do – Ask God right now what He wants you to do with this and then begin to take action, right now, today, soon, don’t put it off. Next, get a book on the topic and actually read all of it. Perhaps you can consider asking someone you respect for advice on how to improve, or to give you an honest critique of how you are currently doing. When ready, talk to your wife about your desire to grow and change, and be open to her suggestions, without being defensive or hurt. Whatever you hear from the Lord or decide to do, implement something today, no matter how small. If we do not start we will never make any progress. The task is at hand and it is well worth our time and efforts. 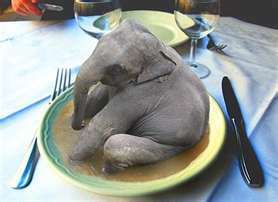 Grab a fork and dig in guys, start eating that elephant! Husband, father, grandfather, pastor and author that loves his Lord, wife, family and the Word of God. Please let me know how I may help you in your journey. Don't waste it on yesterday's failures or tomorrows problems.